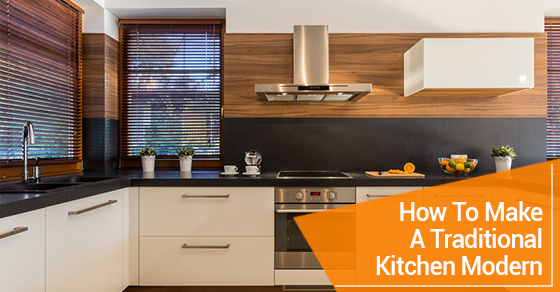 It is a common fact that homeowners have to come to terms with: the kitchen is the most used room in the house. That means that when people come over, whether it’s simply friends or family, or people that may be interested in purchasing your home, the kitchen is going to receive a lot of attention. If you bought an old house, or even if you decided to opt for a traditional kitchen in a new house, and you want to modernize it, there are some things you can do to achieve the look you want. Below are some modern additions to make to a traditional kitchen. One of the first and easiest things you can do to give your kitchen a more modern look and feel is to simply give it a fresh coat of paint. A quick coat of white paint applied to your kitchen cabinets can make them look like they are from this year’s kitchen catalogue. If you are thinking about investing money in modernizing your kitchen, allocate the biggest portion of your budget to a new backsplash. Even to people who don’t have much experience with interior design and kitchen remodelling, a new, sophisticated backsplash can make a kitchen look much more modern and more expensive. This is a fairly cosmetic change, but replacing old hardware can instantly remove years from your kitchen. New knobs and handles on doors and appliance settings can make things look a couple of years old that are actually a couple of decades old. Simply replacing an old, ornate handle with something newer and sleeker can make your traditional kitchen seem like it just came off the showroom floor. Storage trends change over time, no matter where you are in the house, and that certainly holds true for the kitchen. One of the major new changes to kitchen design is the advent and prevalence of open cabinetry. Ditch the old, traditional cabinetry and leave your cabinets open for a sleek, modern feel where open concept is what’s hot. This is perhaps the most expensive part of modernizing a traditional kitchen. New appliances are not cheap, and while there are certainly bargains available, this is going to take up a large portion of your budget. That being said, a new fridge, stove and oven are the hallmarks of a modern kitchen and are essentials when trying to achieve a truly modern look and feel. Your kitchen can add to, or take years off of the age of your house. An older house with a modern kitchen looks and feels instantly newer. While a full kitchen overhaul is by no means a small task, there are certain steps you can take, if you want to tackle it piece by piece, to make your older kitchen seem brand new.